Nice board ready to install. 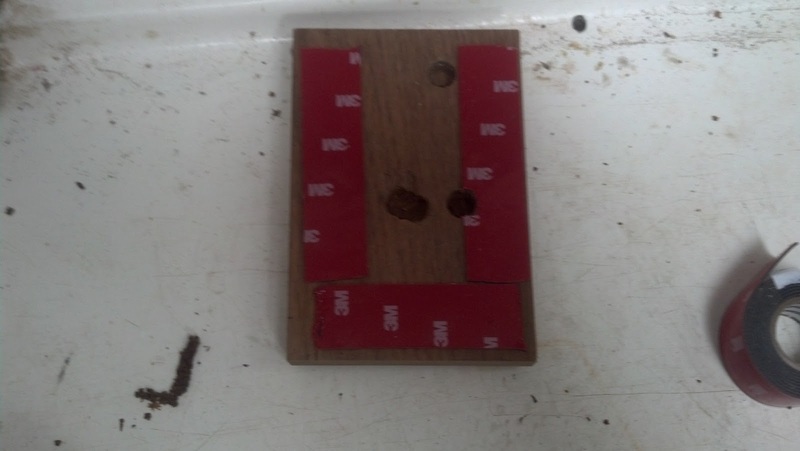 I drilled holes in the back of the teak plate to match the mast step through bolts. 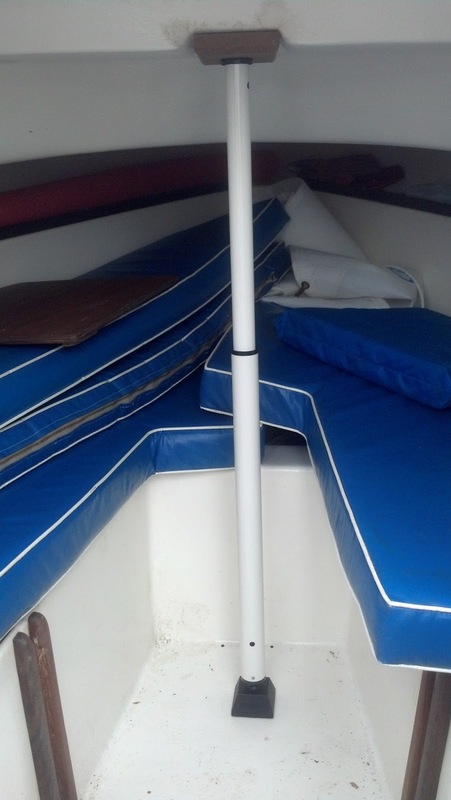 I did not remove the mast step and put extended bolts on. 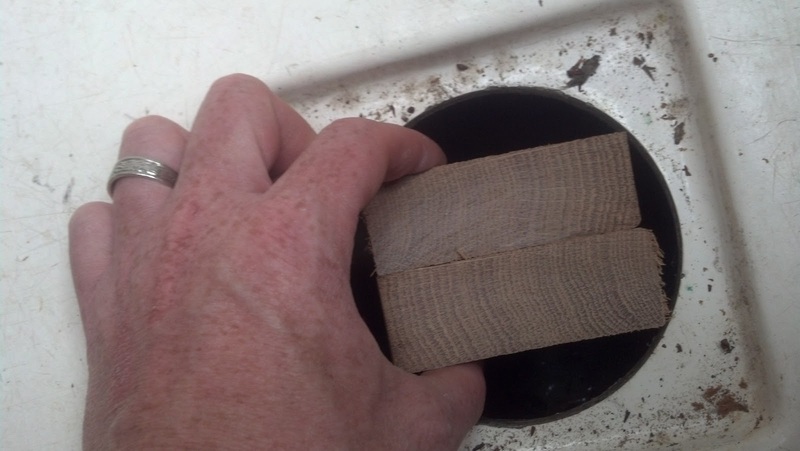 I wanted a smooth surface on the bottom of the teak no bolts coming through to hit my head on. They would also be in the way of the compression post. 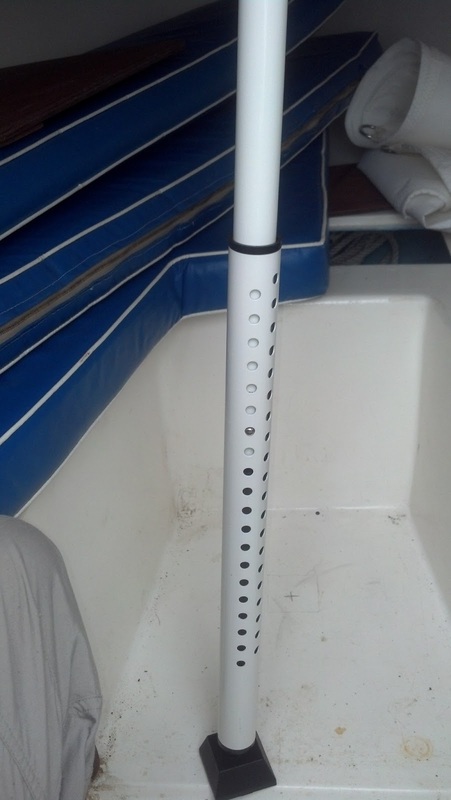 Drill holes to match mast step through bolts. This is where the 3M permanent mount tape comes in. This stuff is tough but not completely impossible to remove should I need to remove the mast step at a later date. Here it is installed. I'll varnish it later when I do my maintenance coat on the rest of the teak later in the season. I started thinking I'd go in this way. 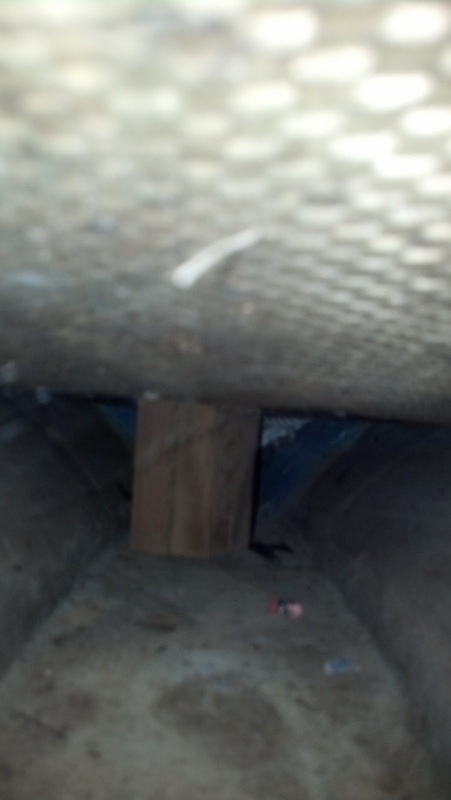 After fishing the blocks back out I ended up putting them in through hatch in the v berth. 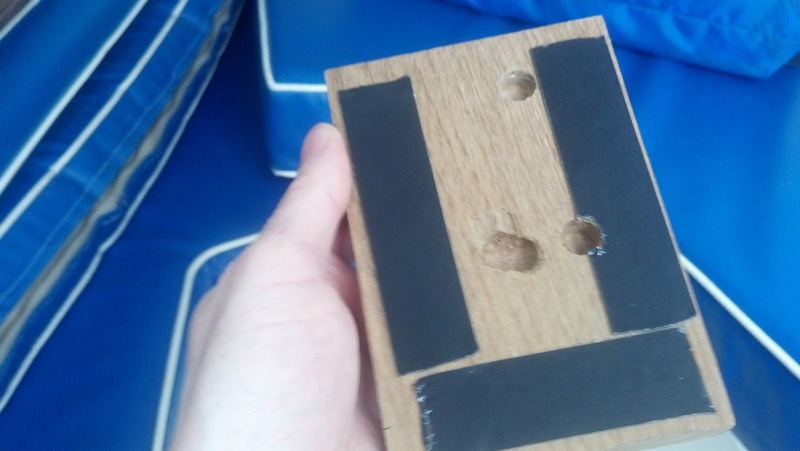 After some wiggling and jiggling I pressed the boards into place. Then poured epoxy in around the base. I will probably do this a few more times to be sure it does not shift. In place below cabin sole set firmly on the keel. 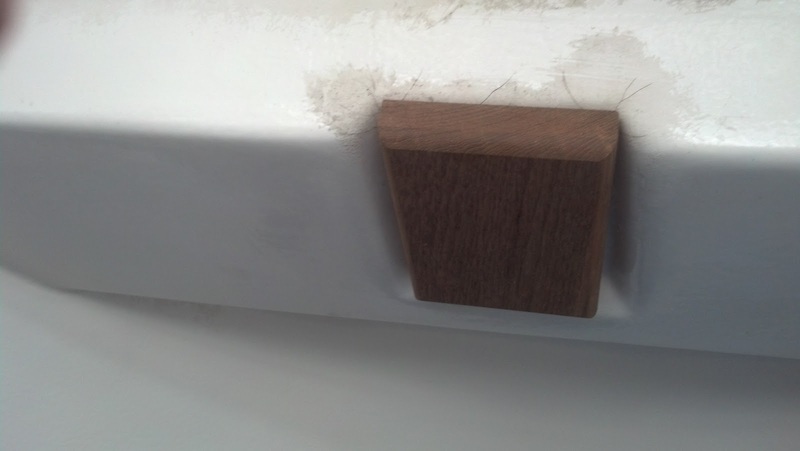 The next step is to find the right setting for your master lock door brace. As you can see it is quite adjustable. Here it is final installation. 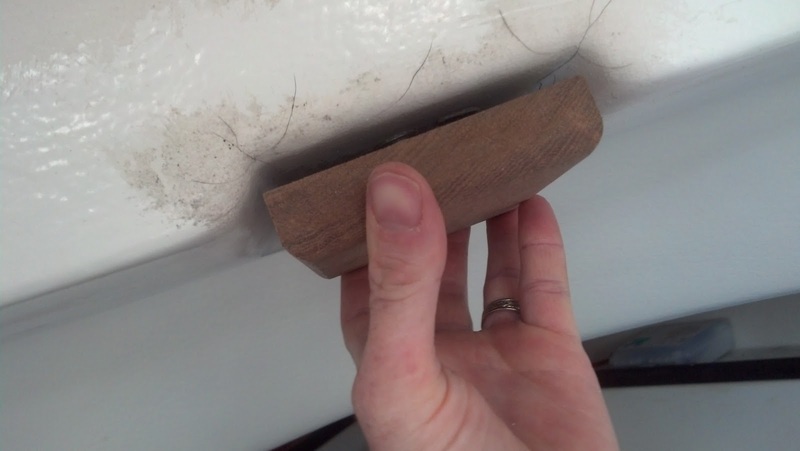 The master lock bar is held in via tension between the cabin sole and the cabin ceiling. 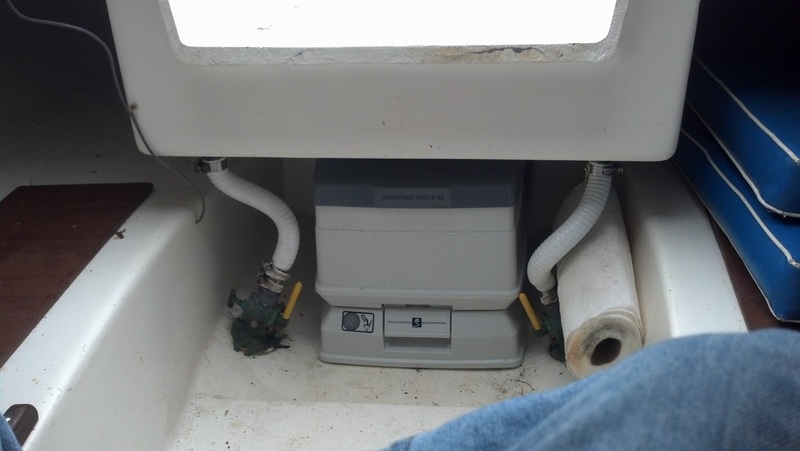 The best part of this installation is the compression post can be removed and the V berth is fully functional. Finally, there is always the question where to stow the head? Mine fits quite well under the cockpit sole. Head goes under cockpit sole between the scuppers. Chris, that is a great sequence of photographs. The door brace I have not seen before; where do you find those? As for compression, I've not observed any noticeable compression on my cabin while under sail. I have not measured it with a tape; suppose I could do that. I figured that unless I observed a problem I'd not worry with fixing it. Perhaps adding a spinnaker might be the extra that would require it. Not sure. William you can pick the door brace up at any big box hardware store, menards, home depot, lowes. I really have not seen any saying in my coach top but I figured this is cheap insurance for when I run my mast top spinnaker. I also have a small spinnaker as well "about half the mast." I wouldn't worry about to much. Hey Chris, was relooking this posting of yours. You made your spinnaker, I think, but is there a site which caters to our Typhoons for spinnakers? @William Mccoy I actually bought both of my Spinnakers on ebay. My small one is from an old Mercury class boat. It is a bit under sized I'd say but looks good. My Large Spinnaker is off a 22-25 ft boat and goes all the way to the mast head. I fly the large one like a genaker or asymmetric attaching one of the clews to a swivel forward of the fore stay. I purchased it with the intention of having to cut it down for the dory but it fits really nicely. You might check out Bacon Sails they will likely have something used that is not to pricey. I'm in the process of rigging a set off blocks all the way to the stern dedicated to running the spinnaker sheets. Thought off you when I was drilling through the taft rail the other day. Chris, I found your pics and comments on the compression post most helpful. Recently, I bought a Typhoon and this project is on the list. 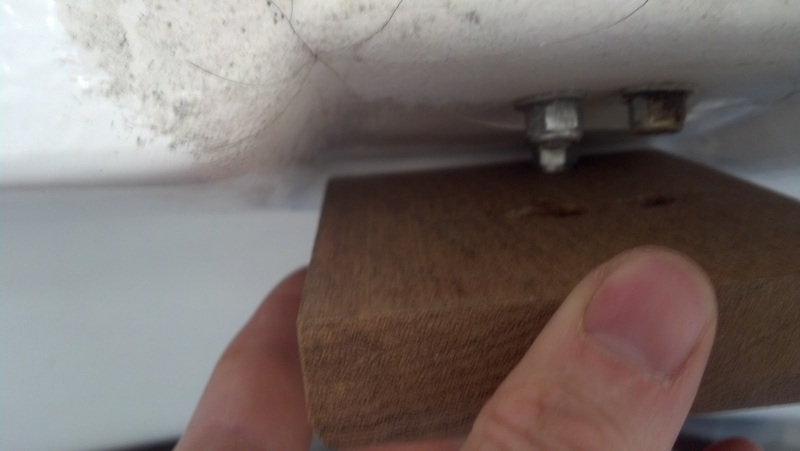 Questions - the wood blocks that rest on the keel, what is the correct height? 4.5 inches? 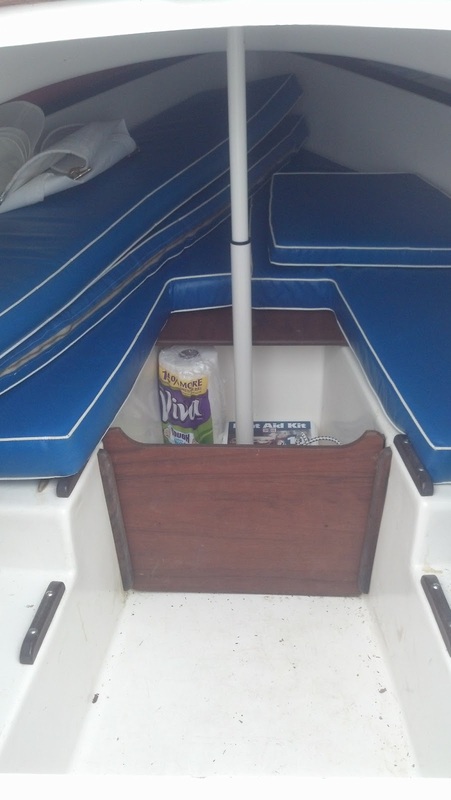 Also, how difficult is it to get the blocks in place from the V-berth access plate? Pete for my boat 4.5 inches worked great. I do recall that pressing them in was a bit hard but I wanted them to be stiff to support the floor. The V-berth entry is the way to go for sure. It is pretty easy to access and press them down in. Getting the epoxy in place was a bit trickier I just pored my in but if I'd have been thinking I would pry use a syringe. I only use mine when I'm flying my full size spinnaker. William of Baggy Wrinkles <his blog is in the side bar. Also used this method I like the counter sink he did on the top plate. You might want to add that. Hi Chris. I'm a new owner of a Typhoon and I've read a lot of your (and Bill's blog) on Typhoons. Thanks to you both for all the great info. I'm going to put in a compression post too. 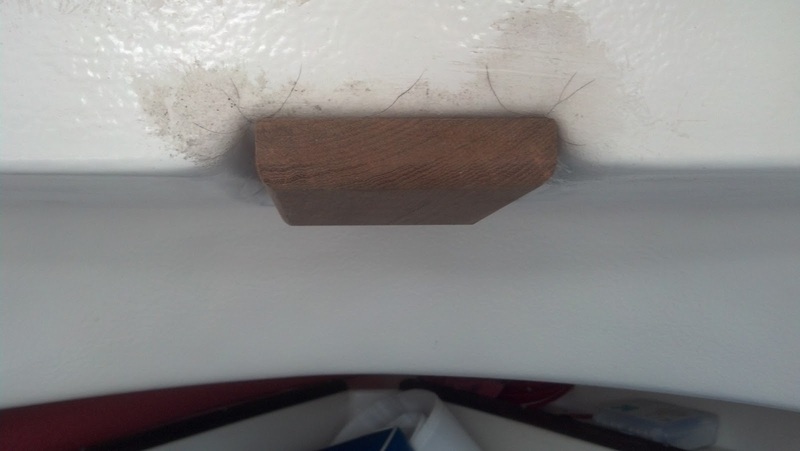 I'm not on my boat right now, but I am in my shop and i'd like to make the top wood 'plate' for the compression post - what are dimensions of that top plate?